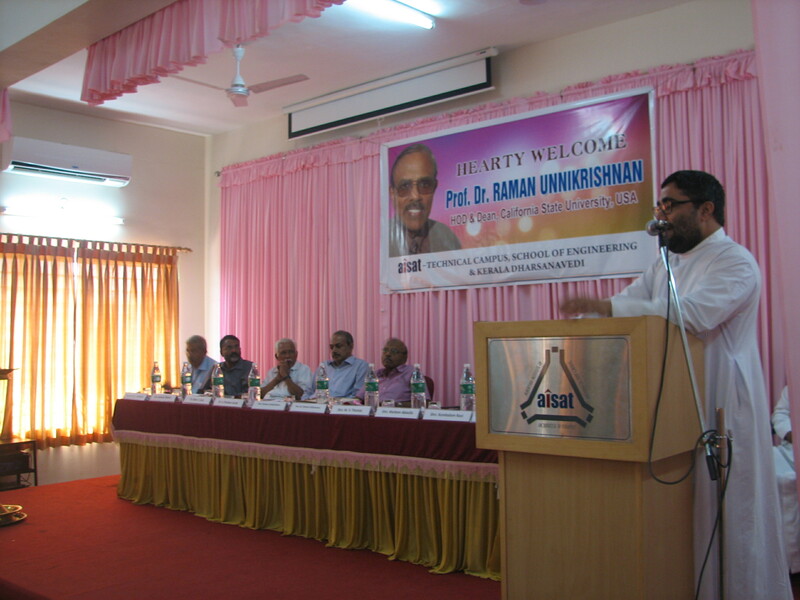 A talk on “Global Relevance of Technical Education” by Prof. Dr. Raman Menon Unnikrishnan, HOD & Dean, California State University, USA was held in AISAT Technical Campus, Kalamassery, jointly organized by the Albertian Institute of Science and Technology and Kerala Dharsanavedhi on 03rd January 2015. Prof. Dr. Raman Unnikrishnan in his keynote address observed the profound shift in the global mobility of engineers and the need to develop technical education to incorporate sustainable lifestyle patterns. The chief guest equally enjoyed the opportunity to address and interact with the Purple League students of AISAT and was delighted to reply to their questions. Prof. Dr. K. Poulose Jacob, Pro Vice Chancellor, Cochin University of Science and Technology inaugurated the function. Shri. A.P. 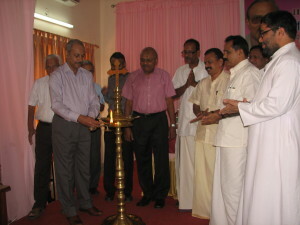 Mathai, Chairman, Kerala Dharsanavedhi welcomed the audience. Rev. Dr. Clement Valluvassery, Manager, AISAT delivered the presidential address. Mr. Abraham Tharian, President, State Forum of Bankers Club, Prof. Dr. Babu T. Jose, Director, AISAT, Prof. Dr. K.E. George, Principal, AISAT, Shri. Muttom Abdulla, President, Mahatma Cultural Forum offered felicitations on the occasion. Rev. Fr. Alex Kurisuparambil, Associate Manager, AISAT presented a memento and draped a ponnada on the chief guest. Shri. Kumbalam Ravi, Secretary, Kerala Dharsanavedhi proposed the Vote of Thanks. Prof. Dr. Raman Unnikrishnan is the Dean of Engineering and Computer Science at California State University, Fullerton since 2001. Prior to 2001, he was with Rochester Institute of Technology in Rochester, New York where he was professor and head of electrical engineering for 10 years. Dr. Unnikrishnan is a Past Chairman of the Rochester, NY Section of the IEEE. He is the recipient of numerous professional awards including the “Eisenhart Award for Excellence in Teaching” at RIT and a professionalism award from the Xerox Corporation. He received the IEEE “Third Millennium Award” in 2000. In 2006 he received the “Missouri Honor Award,” from the University of Missouri for his technical contributions. 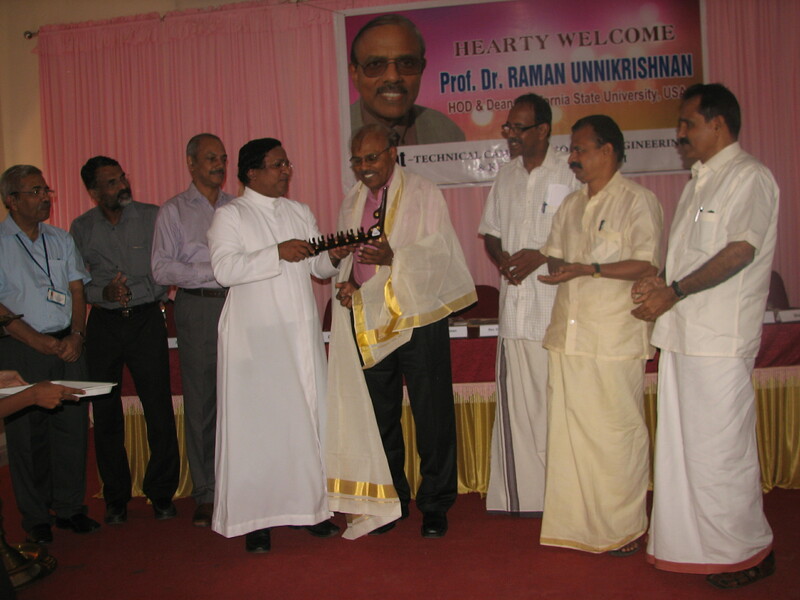 In 2009 Dr. Unnikrishnan was honored by South Dakota State University with a “Distinguished Engineer Award” for his contributions to the profession as an engineering alumnus. He has been a Commissioner of the Engineering Accreditation Commission (EAC) of ABET since 2008. Besides the US, his international accreditation experience extends to Mexico, Qatar, UAE, Saudi Arabia, Turkey and Colombia. ABET also assigned him as a Mentor to India to facilitate the country’s quest to become a member of the Washington Accord, a multilateral mutually recognizing alliance to ensure mobility of engineers across geographical boundaries.